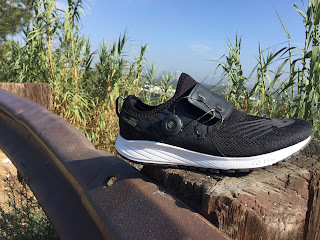 Road Trail Run: New Balance FuelCore Sonic Review: Boa, was it you I was looking for? New Balance FuelCore Sonic Review: Boa, was it you I was looking for? The New Balance FuelCore Sonic is an uptempo daily trainer/racer with the soul of the original Vazee Pace and a new twist (pun intended, sadly) on closure systems. 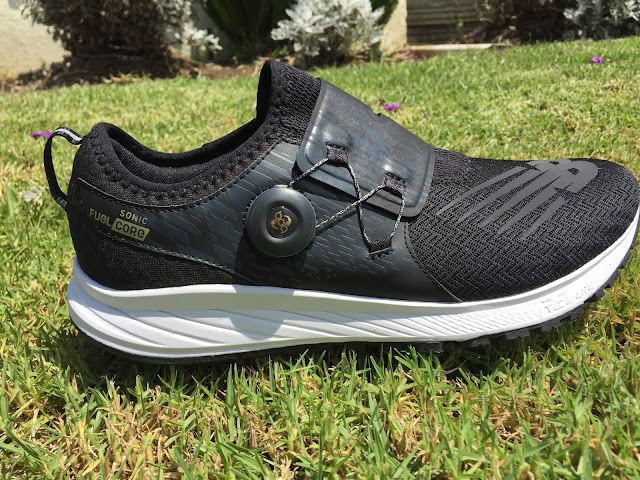 It weighs in at about 8.4 ounces/238 grams for a Men's 9, 7.2 oz./204 for a Women's 8 and the stack heights are 24mm in the heel and 18 in the forefoot, 6mm drop. 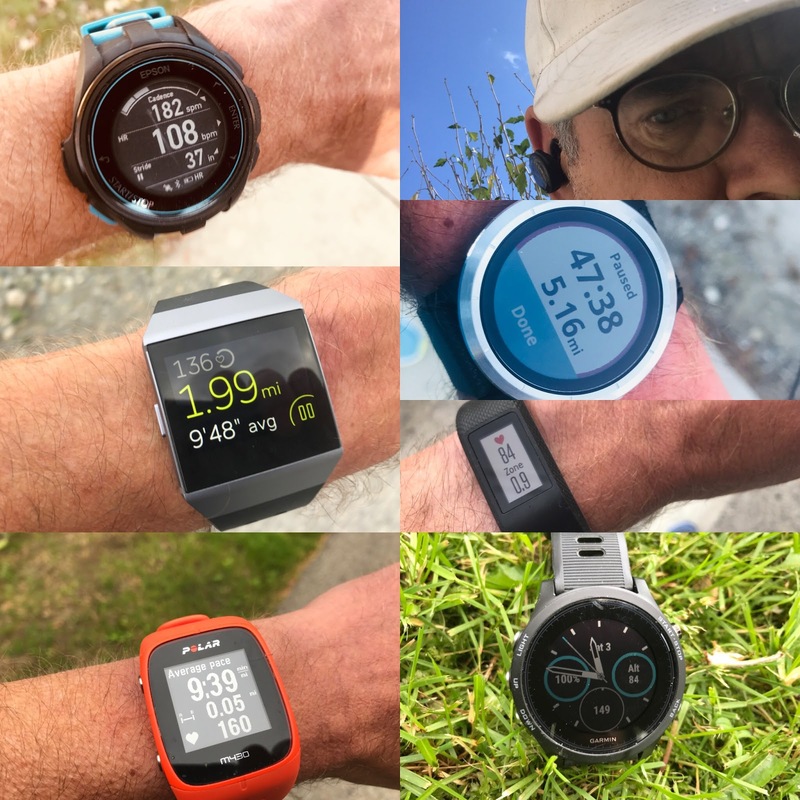 There are definitely similarities to the Vazee Pace, but some notable differences too. The most immediately obvious thing about the FuelCore Sonic is that it has no laces! That's right, there are no laces. 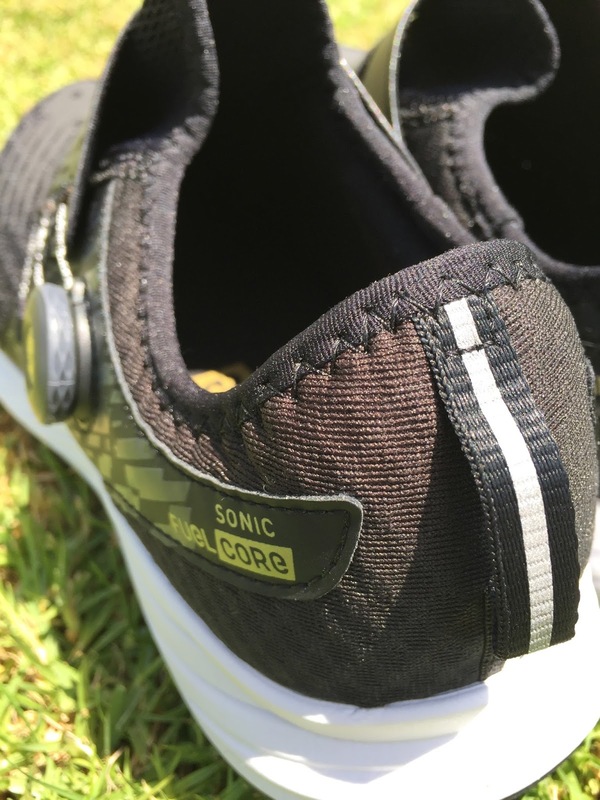 The closure on the FuelCore Sonic is a Boa system. 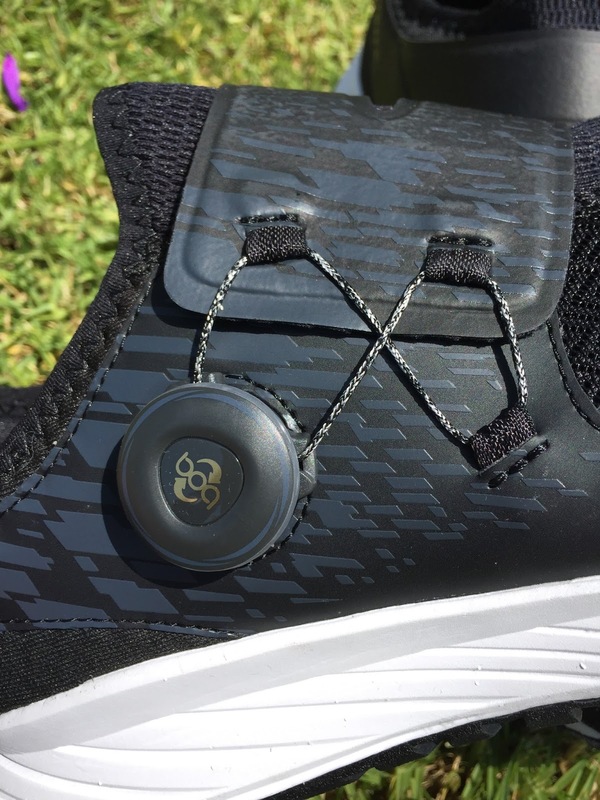 For anyone unfamiliar with BOA closures (often found on bike shoes), there is a thin "lace" that runs through some eyelets and a round dial that, when in gear, ratchets the lace closed through 3 eyelets to tighten the shoe. There is a strap running across the top 1/3rd of the foot. The strap itself is one piece on the outside of the foot near the BOA wheel and separates into two pieces as it gets goes across the foot to the inside of the shoe. Essentially this forms a smooth overlay that you can ratchet down as you need to secure your foot. The BOA wheel can be pulled out to release the tension and pull the foot out. It's a terrific system that's easy to dial in and lock your foot down. I have some minor quibbles with the BOA and strapping layout on the FC Sonic, but overall it works well. For those of you out there who are about to say "well, I just don't trust the system not to break, what if it breaks during a race?". I say bah! It seems every bit as likely that a shoelace might break, and I don't know anyone who is wandering around the starting line with an extra pair of laces in their pocket. The "lace" of the BOA is called TX4 and is made of a combination of Dyneema and Polyester. It's lightweight, strong and glides through the eyelets. Before I talk about the rest of the upper, let me just gripe a tiny bit about the layout of the straps and the BOA system. A Caveat--I really, really like it and hope to see it on more shoes. That said, I feel that on this shoe the straps start just a little too far up the foot for absolute lockdown of the midfoot. I think perhaps three straps, or making the second strap just a hair farther down might make this a better shoe. For me the forefoot feels just a little loose, and I'd like a way to adjust it. It also takes a couple of runs for the BOA and straps to seem like they adjust totally evenly across the shoe. There is a loop of fabric on the back of the heel in the FC Sonic that is, for once, actually useful. There's not much of a heel counter on this shoe and since it is a bootie there aren't many places to grab it. This loop serves a great function in helping pull the shoe on and off. It's hard to describe how well it works, but it does. On most "tri" shoes that I've used that have some sort of pull tab I never touch the thing, but the loop on the FC Sonic serves its purpose well. Okay, so for the rest of the upper. It's a no-sew bootie that's soft and comfortable. As I mentioned before there's a little bit of play in the front part of the foot due to the BOA closure, but generally the fit is pretty locked in--no problems at all with heel lift. 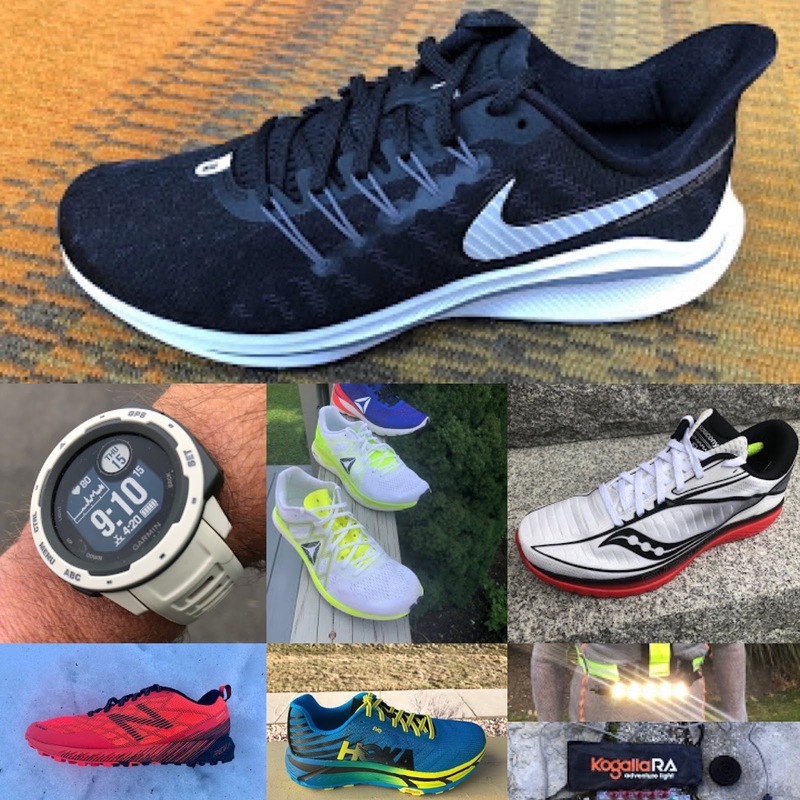 I'm in my usual running shoe size and haven't had problems, but if you tend to size up, you may want to do so. The fit is comfortable and the shoe pretty much disappears on the foot. The midsole is good ol' reliable New Balance Revlite. This is the same material used in the Vazee Pace, the 1400 and various other New Balance models. I find it to be on the firm side with a decent amount of energy return. 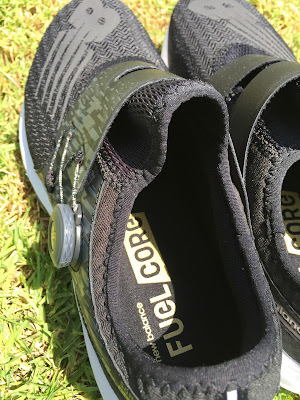 I'm not sure where the name Fuel Core comes from--as it would seem to indicate some sort of new material, or magic energy return pod--alas it is just Revlite. This is good news if you like Revlite--which I generally do. The outsole is a different pattern than the Vazee. The traction and feel are good. 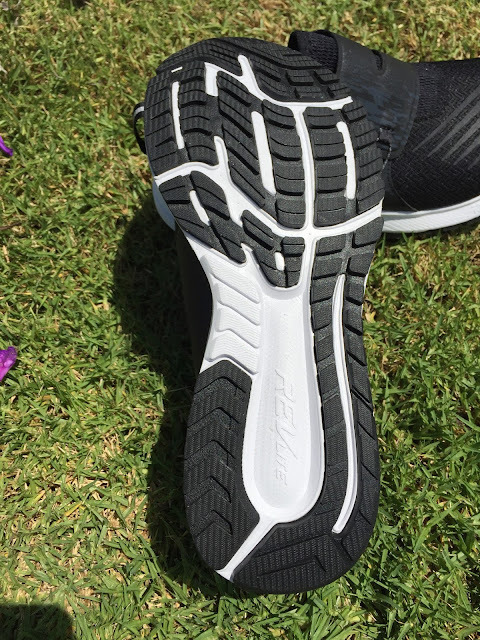 There's plenty of rubber to meet the road and a couple of nice, big flex grooves that run across the shoe to make it plenty flexible. 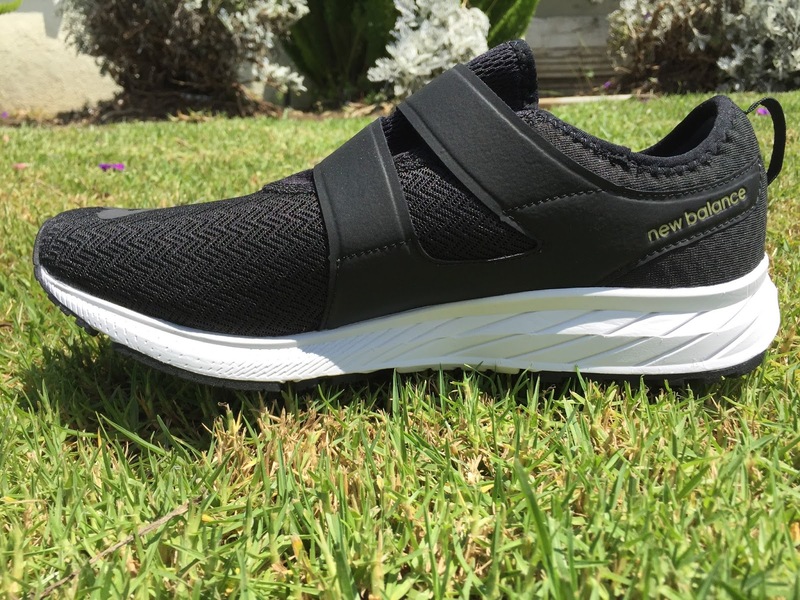 The New Balance FuelCore Sonic is firm with just a hint of cushion. I'd say it's a little bit firmer than the 1400 and a little less firm than the Vazee Pace. It feels good at any pace, but tends to shine when you step on the gas a little bit. Overall it's a really nice riding shoe. I've found myself reaching for it pretty often. If you liked the Vazee Pace, and you generally like Revlite, this is a great shoe. I'm a big fan of the BOA system and the shoe pretty much disappears on the foot. I might tweak a couple of things on the FC Sonic, but it's a great first version of a shoe. Mainly, I'd like to see the straps and BOA closure tweaked a bit so the lower part of the forefoot is more locked down. It's a good every day trainer, and picks up to speed really well. I'll compare it side-by-side to the 1400 v5 down below. I'm hoping to see BOA closures on more shoes in the future. 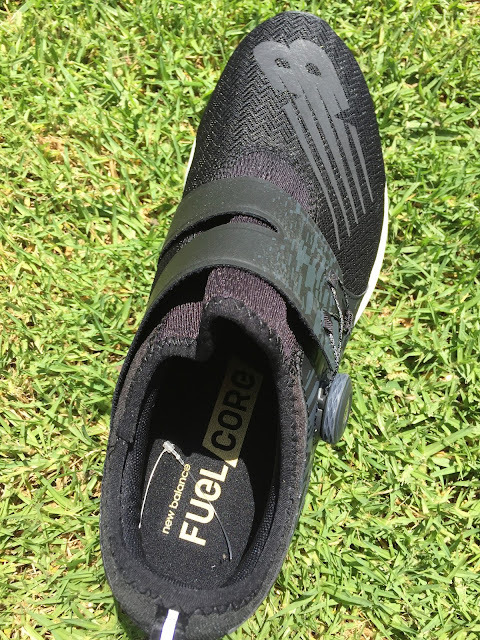 I'm not sure about the name Fuel Core Sonic as it seems that NB has a new material called Fuel Cell that isn't involved in this shoe. It might have been better called VAZEE BOA. 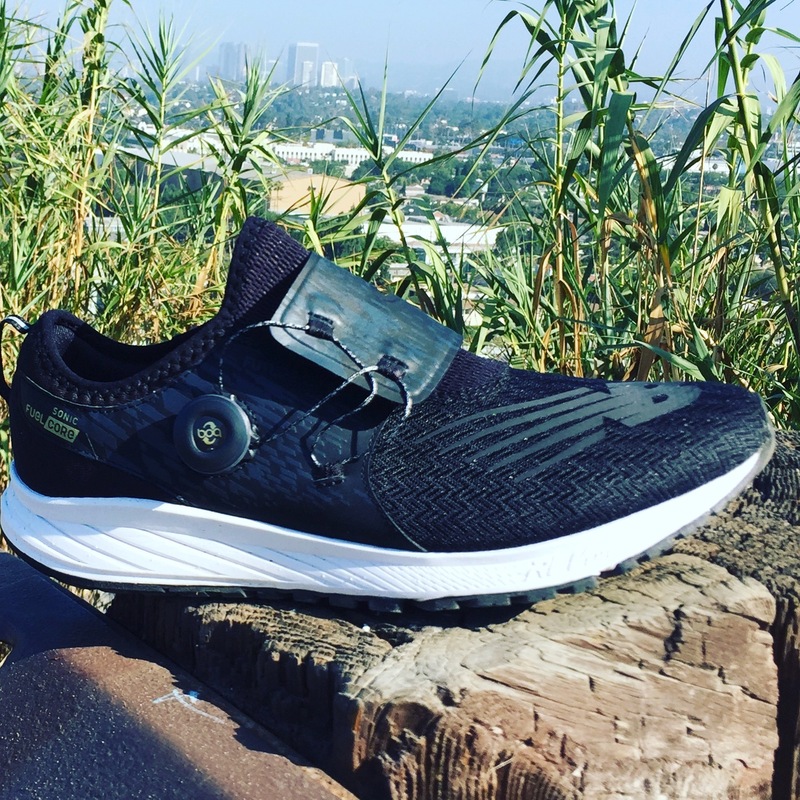 Running side by side in these makes it clear that the FC Sonic doesn't have the same buttery smooth ride as the 1400 V5. The Sonic is a firmer shoe and the ride is ever so slightly clunky in comparison to the 1400. I'd love to see a 1400 with the BOA closure on it. The FC Sonic is definitely closer in spirit (as I've mentioned) to the Vazee Pace. The Razor offers a softer, more flexible ride than the FC Sonic. They're both good shoes, it just depends how firm you like it. The Fuel Core Sonic was provided at no cost. The opinions herein are entirely the author's. 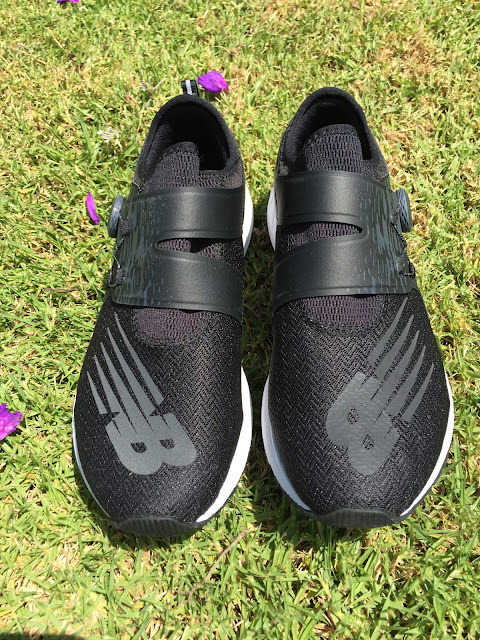 The BOA lacing looks interesting but I still can't get used to the idea (visually at least) of a shoe minus proper lacing. That said, I liked the feel of the Vazee Pace (and the 1400's) and from what you say, I'm inclined to give this a try if it ever comes to this part of the world.